The FCC has announced they they have started a new website that tracks how well mobile carriers are following commitments they have made to notify consumers when they have been the victim of "bill shock". This is defined as a sudden and unexpected increase is a consumer's wireless bill. It usually happens when customers exceed their monthly cap on wireless talk, text and data. it can also happen from roaming charges that add up when a user is away from his usual pipeline. A recent survey found that 30 million Americans, or one out of six, have experienced bill shock at one time or another. More than 33% had a $50 increase in their monthly bill, while 23% said the jump was $100. In October 2011, the FCC and the CTIA combined to announce a new program that would alert wireless users when they were close to exceeding their monthly caps on data, voice and text. To see how well these firms are adhering to the regulations, the new FCC website contains information in a graph that is updated monthly. Carrier information comes from the CTIA, which covers 97% of U.S. cellular customers. The FCC receives the info each month and posts it on the graph so that consumers can see which operators have fulfilled the requirements. Each mobile operator must offer a link to the details of the information on its website. If a carrier offers unlimited service of any of the designations, it will show as N/A in the charts. Each carrier has agreed to notify each customer twice before charging him or her with overage charges. One alert takes place when the customer is close to going over his/her monthly cap, and the second is when the cap for voice, text or data is surpassed. If a customer's handset has been registered overseas, he will receive a notice before incurring additional roaming charges. The alerts are supposed to be provided to customers for free and should be sent directly to them so that a customer won't have to go through a maze of web sites before reading the data. 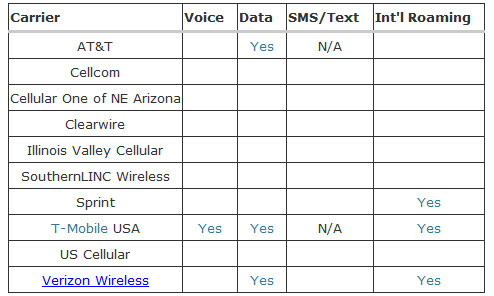 Check the chart to see how well your carrier has been keeping up with the rules. Washington, D.C. – The Federal Communications Commission today launched a new 'bill shock' website (HYPERLINK "http://fcc.us/billshocks"http://fcc.us/billshocks), an online tool to help consumers track implementation of recent commitments by wireless carriers to provide usage alerts before and after consumers exceed their plan limits. Bill shock is a sudden and unexpected increase in monthly wireless bills that happens when consumers' unknowingly exceeding plan limits for voice, data and text. Bill shock can also happen when consumers travel abroad and get hit with unexpected international roaming charges. A recent FCC survey found that 30 million Americans – or one in six wireless users – have experienced bill shock. In October 2011, Chairman Julius Genachowski HYPERLINK "http://hraunfoss.fcc.gov/edocs_public/attachmatch/DOC-310290A1.pdf" announced a new program that would provide free alerts for wireless consumers as they approach monthly voice, data and text limits, and after those limits have been exceeded. Chairman Genachowski was joined by CTIA-The Wireless Association, which accounts service to approximately 97% of U.S. wireless consumers. FCC Chairman Genachowski said, "Using technology to empower consumers with information has been among the top priorities of the Commission. Last October, we were pleased that CTIA-The Wireless Association and Consumers Union joined us to announce new commitments to provide free alerts to consumers before they approach limits and incur fees. We also promised an online resource with information about when carriers begin providing these alerts. Today, we deliver on that promise." The new website is available at HYPERLINK "http://fcc.us/billshocks" http://fcc.us/billshocks. The Commission will regularly update the table to reflect each carrier's progress in providing the bill shock alerts, based on information provided by CTIA-The Wireless Association, and in partnership with Consumers Union.